There was a time when the bigger-is-better clan had just two options  the Tata Safari and the Mahindra Scorpio if they wanted to upgrade from their large sedan. Alternatively they had to part with a lot more cash for an imported SUV. Today, image makeovers are easier courtesy the entry level SUV segment with more choice, and there are more options on the horizon. For today's bout, in the blue corner weighing in at 1308kg and using the Renault 1.5l K-type engine making 110PS and 248Nm, is the Duster. The French via Romanian compact SUV impressed us on a 3000km road trip from Mumbai to Delhi and back over the Formula 1 weekend. In the red corner weighing in at a hefty 2095kg is the mighty Safari Storme from Tata. Its refined 2.2l variable geometry turbo equipped (VariCOR) engine makes 140PS and 320Nm. It was the epitome of ride quality and style when it was launched in India 14 years ago and has now received a fresh look. The numbers might suggest that the odds are stacked against the Duster - the Storme has the numbers on its side. Can it stand up to the might of the Safari Storme? Face to face the Duster looks imposing with its wide, ready to pounce stance, it's only when you actually come close that you notice how compact it is. The large grille, squared off headlamps and the front bumper cladding all aid in maintaining the illusion of imposingness. The Storme on the other hand is actually large and makes no excuses for it. The Storme has tried to borrow from the looks of the Land Rovers but the overall effect has not left a very attractive face. Both cars carry the spare tyre under the boot and so sport uncluttered behinds. The design of their tail sections is surprisingly similar with small tail lamps and large chrome accents displaying their identity. What differs is their stance, with the Duster maintaining a low profile with the wide haunches while the Storme adopts a tall boy approach and also has twin exhaust pipes. In profile the Duster looks low and long while the Storme just looks large. The Duster does present a more cohesive picture with nothing standing out yet nothing out of place. The Storme carries forward too much of its old DNA with the cosmetic changes to the front and rear end not quite managing to brighten up what is now a 14-year-old design. The Duster's sporty look tips the scales in its favour for us and edges ahead in round one. The interior of the Duster is where the economy engineering shows through - there are hard plastics wearing cheaper feeling grain, the black trim around the central control unit appears a bit out of place. It has come a long way from the Euro Duster, but it's still an economy-oriented cabin. But it still manages to look superior to the Storme. The new Safari was a bit of a let down to us when the car was revealed last month. We were hoping for a more upmarket Aria-inspired makeover, but what we got was an improvement over the old SUV instead. In comparison to the Duster, the plastics feel flimsy and we ran into issues with the lid of the dash-top storage space as well as the plastic cladding on the passenger grab handle (it broke during the test). Further, in the course of the road test, the Storme also developed a number of squeaks which is unbecoming of an SUV in this price bracket. What the Storme does excel at though is in delivering more space inside. The vast boot holds two jump seats to allow a total of seven people to be accommodated. The Duster is perfectly happy to carry five adults and its boot, though smaller, can swallow luggage for a seven-day road trip plus two cartons of books for Ashok's grandmother on the return leg of our trip. The air-con unit in the Duster though, had our second row passengers fighting over the single vent, directly in contrast to the Storme passengers who could be freezing with the roof-mounted and central floor mounted vents both doing a good job. So in round two, then, the Tata holds its own on account of space for luggage and seven seats, despite feeling like the interior could be spruced up further. The ride quality and handling of the Duster really impressed me on the Delhi trip where the Duster was very comfortable and pleasing to drive on the mixed roads. Judging from the company it was in (See Halley's story on the BMW 3 Series vs Audi A4 elsewhere in this issue), that says a whole lot. On highways and paved roads, either smooth or patchy and pot-holed, the Duster excelled. The ride quality was sweet and the handling was almost car like on twisty sections, with negligible roll. Push too hard though and it does understeer, which is not necessarily a bad thing. It's the Duster's way of reminding you that it's not a car. The Storme has received completely new underpinnings and its body-on-ladder chassis is based on the Tata Aria. This has improved things compared to the old Safari but there is a lot of body roll in turns and the nose dips quite dramatically under hard braking. Combining the two (turning and braking) can be quite a hairy experience, so it's not quite as fun to drive in the hills. The Safari when it was launched and for many years thereafter was known for its great ride quality and it still counts this as one of its strong points. The goal posts have moved and it's now out-classed in its favourite subject by the Duster. Round three has the Duster pulling clearly ahead of the Storme heading into the final round. The Duster's 110PS leaves the Storme's 140PS in the dirt. The Renault is 3.7 seconds quicker to 100kmph and the Storme is further behind still in roll-on acceleration. But with the 30 extra PS lugging a whopping 787kg around, these numbers aren't really a surprise. But the Storme does have four-wheel drive as an option on the top model and it knows what to do with it. Take the two off-road and the Storme proves really capable. Renault is not offering the four-wheel drive Duster in India (yet - it gets a different suspension setup) and the front-wheel drive cannot keep up. But it does have good ground clearance, high approach and departure angles which means fair weather soft-roading is eminently possible. 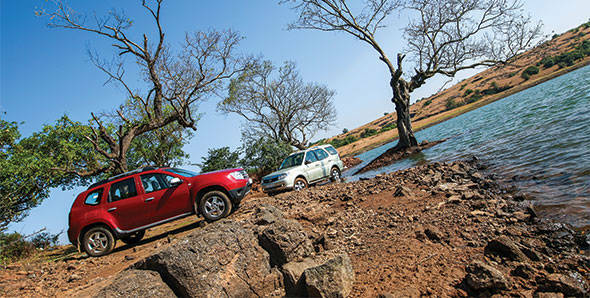 During the test, our off-road sections didn't really trouble the Duster despite some very broken terrain though the Storme's long travel suspension and shift-on-the-fly four-wheel drive system proved to be completely at home. The Storme's extra weight, though, returns to haunt the Tata when it comes to economy. The Duster's 15.87kmpl overall was 2.3kmpl better than the Safari's. The Duster is the easier SUV to live with. It's great on the road and can be taken off the beaten track too. Its superior ride quality is coupled with great handling for an SUV and has this smaller package leaving the Storme in the dust. The Storme is an improvement on the older Safari and what you do get is a lot of space and good ride quality. If you do opt for the Rs 13.66 lakh (ex-Mum) top of the line VX Storme equipped with 4x4, you will get a very capable off-roader but the Duster top spec RxZ manages to undercut the Storme by almost two lakh and offers the better complete package making it our clear winner.